Our service has been to create thousands of deeds for real estate professionals and property owners throughout the United States. Our software can create all of the popular deed forms. Our interview walks you through the process of choosing the form that works for you. Transfer property with no warranty of title. Transfer property with a limited warranty of title. Transfer property with a full warranty of title. Transfer property at death by designating a beneficiary. Transfer property at death while keeping control during life. Transfers at death, but gives away some rights during life. * Lady bird deeds and transfer-on-death deeds are not available in all states. We recognize that many people or unfamiliar with deed preparation. Our user-friendly interview provides contextual articles and videos to teach you what you need to know to create a customized, ready-to-file document. Our platform is attorney-designed from the ground up. It is based on the exact drafting system has been used to prepare thousands of deeds for individual clients and government agencies. This experience is built into the interview process. Many online deed forms don’t take state-specific filing requirements into account. This can create validity and recordability issues. Our deeds were designed to include the state-specific language needed for recording and enforceability. Some companies sell fill-in-the-blank forms that lock you into a specific scenario that may or may not fit your situation. Our online deed preparation service has the features you need to create the right deed for your state and your specific situation. Get your deed in minutes. As soon as you complete our easy question-and-answer interview, your document is sent to your e-mail address. Like to do things yourself? 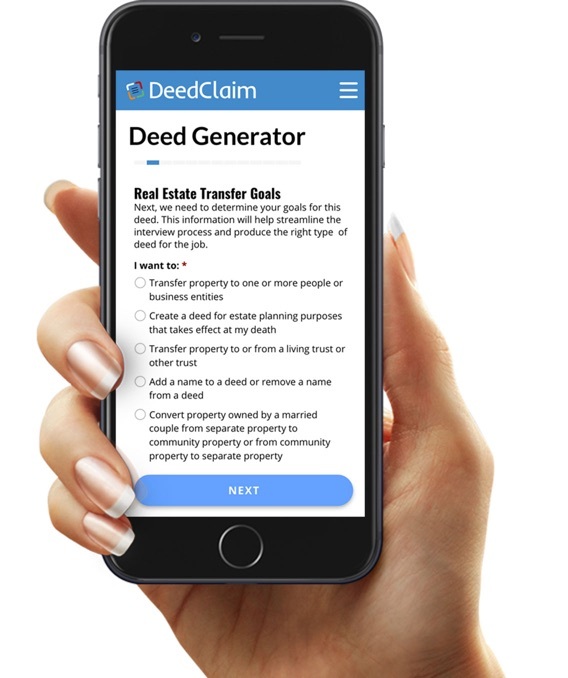 Our deed creation platform helps you create a customized deed to transfer your real estate. Just enter your information and create your own deed. Unlike many other online form providers, each of our deeds is attorney-designed to meet the legal requirements for filing in your state. We give you more than a fill-in-the-blank form. Our platform's application logic selects the right legal provisions based on your choices. The result: A deed customized to your situation. No legalese spoken here. We walk you through the more complex aspects of real estate law with clear, plain English explanations. We don’t leave you on your own to fill in blanks on a static form. We walk you through the process with context-specific education. Need to transfer property to or from your living trust? We can handle that. Our platform allows transfers into and out of trusts. Need to transfer property to your business or sell business property? No problem. Our platform makes it easy to transfer property to or from a business or other organization. Our platform supports multiple owners. Whether it's a husband and wife or other multiple owners, we support it. Our platform makes it easy to draft deeds to transfer property to or from multiple owners. DeedClaim works on any device. If you need to switch between devices, our Save & Resume feature allows you to save your work as you go.